Prion diseases are neurodegenerative, attacking the brain. 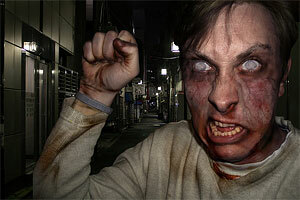 Could they be responsible for the recent wave of Zombie attacks across the globe? Original photo: digitalsextant. I’m a sucker for zombie movies; I’ve watched dozens of them. I am especially fond of the Resident Evil Trilogy, where the T-Viruses effectively restructure mortality and create a world of zombies. There is something incredibly satisfying with the zombie movie plot – a virus outbreak devastates a planet but a group of people are immune and fight to save humankind. Having the ultimate evil as a virus also makes it seem more plausible and compelling. Yet viruses and bacteria do not live in limbo. They are alive and under the right conditions can be killed. Which is bad news for Zombies. But what if there existed a substance that acted like a virus or bacteria but wasn’t living? Medicine made a revolutionary leap during the time of Louis Pasteur in the mid 1800’s. The inventor of food pasteurization and one of the founding fathers of microbiology – he was able to prove germ theory. Food spoiled and organisms got sick because of the growth of bacteria and viruses within them. Within sterile environments, viruses and bacteria could be killed off and food could be preserved or organisms could recover from illness or infection. Sterilization works on living micro-organisms. Prions, however, are not living organisms. Prions are infectious proteins. For unknown reasons, these proteins refold abnormally and cause a domino effect in surrounding proteins which in turn mutate into stable structures. Prions will then cause tissue damage and cell death to surrounding areas. Prion diseases are neurodegenerative, attacking the brain and are characterized by “holes” in the tissue. The incubation time for Prion diseases is quite long. They usually surface later in life but after they surface, the diseases are rapid and fatal. Such examples of Prion diseases include Mad Cow Disease in cattle, Scrapie in sheep and Fatal Familial Insomnia in humans. FFI is a disease that literally takes away the ability to sleep and in a few months leads to death. The Book “The Family That Couldn’t Sleep” by journalist D.T. Max follows a family in Italy that passes this disease from one generation to the next over subsequent centuries. Prions have been and still are a medical mystery. What causes them to mutate and aggressively eat away at the brain? How can they be stopped? Because they are not living they are highly resistant to sterilization methods. While viruses and bacteria can be eradicated on equipment through heat, radiation or chemical reagents, Prions are strongly immune. Maybe Zombies are not so far off after all – lurking in the shadow of medicine has been a mutation that is resistant, brain-eating and neither alive or dead. It has some serious similarities to the zombies I have watched over and over again on the big screen. If you want to learn more about Prions and their history, check out Down to a Science’s next reading group which is focusing on the book The Family that Couldn’t Sleep or check out the book Deadly Feasts: The “Prion” Controversy and the Public’s Health by Richard Rhodes. And one more thing – Happy Halloween! I read somewhere (I cannot remember what article unfortunately) that some cannibalistic tribes would contract prions from eating the brains of other humans, and it would actually make them crave more human flesh and blood. Sounds quite zombie-like.